The fans have held protests before and it hasn’t done any good, but it’s never been done at this scope or scale before. CBS didn’t listen to what the fans wanted originally and by now everyone is so fed up with Muhney’s treatment that they wouldn’t want him to return to Y&R. A lot of times, networks ignore the fans and continue to make decisions based on their own set of rules, Y&R has already managed to lose 500,000 viewers since the firing of Muhney, and the ratings have been steadily declining since then. With the loss of fan favorite Michael, it’s likely that they’ll decline even further, especially when this many fans are banding together in protest. Well you reap as you sow. Either way, Muhney’s fans aren’t happy. They lost a great actor from a show they used to love, ruining the show for them and depriving them of the opportunity, for now, of watching Muhney act. It will be interesting to see how CBS handles this debacle. Hopefully they will do something smarter than having another Twitter party at which actors get undressed?? 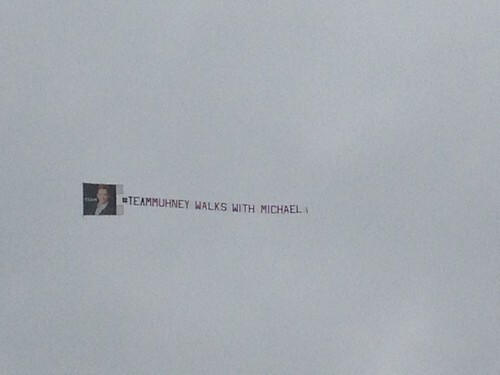 Flying a massive banner above a major studio is a big deal, and the fans definitely have made a clear statement about their love and support for Muhney. If General Hospital gets the chance they should jump at the opportunity to hire Michael. That would be a brilliant move that would please fans and be a boost to the show. Michael Muhney’s Firing from The Young and the Restless Leads To Fan Boycott – Will The Show Survive?